Private sector organizations also grapple with how to set priorities and advance decision making activities in a systematic, evidence based manner. However, the business of coherently drawing-together risk information has continued to challenge many organizations. This challenge is growing since, for example internal and external audits now routinely challenge originations to account for how they have drawn-together risk information, used in any risk-based program activity. To assist clients in meeting the needs for systematically developing and reporting better, more meaningful risk information, Impact Consulting has increasingly become involved in running/ facilitating risk assessment workshops/ priority setting polling sessions. Impact Consulting, has invested in an enabling technology for this purpose – a specialised electronic tool for systematically pooling expert opinion - typically that of the client’s own cadre of knowledge workers, SME, etc. - through a combination of facilitated discussions and electronic voting; applying the Modified Delphi technique. Impact Consulting, owns an electronic voting solution used, in this is setting, but also has insights into the use of comparable offerings. 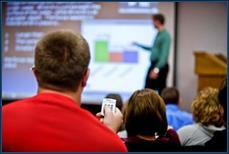 There are others, in the National Capital Region who have technical qualifications to run an audience response system - generically - but facilitators from Impact Consulting are unique in their ability to providing this service, because all applicable team members have meaningful risk management credentials, secret security clearances and the ability to provide associated, integrated risk assessment/ risk analysis and reporting services. We look forward to hearing from you at the address appearing below.